A decisive quarter-final defeat the previous week on home soil in Daejeon, the following week on the afternoon of Saturday 28th July in Geelong, revenge was extracted and status justified. The Korea Republic’s Lee Sangsu and Jeon Jihee, the top seeds, beat colleagues Lim Jonghoon and Yang Haeun, the no.4 seeds (6-11, 11-7, 5-11, 11-8, 11-8) to win the Mixed Doubles title at the Seamaster 2018 ITTF World Tour Platinum Australian Open. At the Seamaster 2018 ITTF World Tour Platinum Shinhan Korea Open, some nine days earlier, Lee Sangsu and Jeon Jihee had been beaten by colleagues Lim Jonghoon and Yang Haeun in three straight games, they had amassed just 15 points (11-4, 11-6, 11-5). In Geelong it was a different story but midway through the fourth game the odds favoured a repeat of the previous week. The opening two games were shared, in the third game Lim Jonghoon and Yang Haeun made the better start, they won the first four points. Lee Sangsu and Jeon Jihee levelled at 4-all but then Lim Jonghoon and Yang Haeun hit a hot streak and clinched the next six points. They secured matters on their second game point. Two games to one ahead, in the fourth game it was Lee Sangsu and Jeon Jihee who made the better start, they went ahead 5-1 but then Lim Jonghoon and Yang Haeun recovered to gain a 7-5 advantage, Lee Sangsu and Jeon Jihee electing for “Time Out” when ahead 5-4. Facing potential defeat, Lee Sangsu and Jeon Jihee recovered, they surrendered just one more point, a deciding fifth game beckoned. Now the momentum was with the top seeds, Lee Sangsu and Jeon Jihee won the first six points of the deciding game, Lim Jonghoon and Yang Haeun taking a “Time Out” after losing the first three points. At 10-4 Lee Sangsu and Jeon Jihee held six match points; then tension, eventually at the fourth attempt they converted. 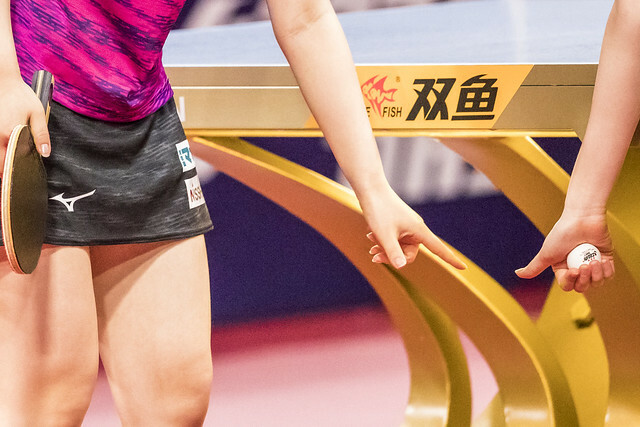 Thus they became the fourth pair to win an ITTF World Tour Mixed Doubles title; in China on home soil Lin Gaoyuan and Chen Xingtong had won, in Japan it was also China with Chen Xingtong once again successful, this time partnering Liang Jingkun.